It’s not coming home.. And what has happened to all the user groups.? So it’s not coming home… but the team did us proud and what a wonderful early summer of football, sun and beer it’s been. Russia has done itself proud and despite all the hysteria and fake news circulating prior to the event, everything went according to plan and without incident. The teams and the fans had a great time, well done Russia on a tremendous World Cup. After the World Cup my mind turned to BITUG’s own upcoming events. BITUG will be hosting the 2019 European NonStop Symposium in Edinburgh Scotland next year. This will be our first ever event in Edinburgh and we are all very excited. The event eBITUG or for short or #EBITUG on twitter; runs from the Evening of Monday May 13th to 17:00 on Wednesday May 15th 2019 and will be held and the world famous Sheraton Grand Hotel Edinburgh. Mark your calendars now and keep an eye on our website for more details of what promises to be a fantastic event. But don’t forget we still have the BITUG little SIG to go this year. This will be held at the offices of Lloyd s Bank on December 4th, again check our website for agenda and the signup page very soon. Following a period of brief searching (ok yes googling) I came across an article.. “I've always been a car nut.” By Glenn Garrahan, Director HPE Business. This was published recently as part of the NonStop insider series. As a fellow “car nut” the title grabbed me straight away. Here’s mine, a modified TVR S3 V6, born in Blackpool UK circa 1992 so she’s getting on a bit but every journey is an adventure, its not how fast they go… its how they go fast that matters. I’d almost forgotten I was researching European NonStop user groups but towards the end of the article was a helpful list of all the international user groups. I couldn’t find any web site links but, hey that’s what Google is for. So, I set off on my internet journey in hope of making new NonStop friends and contacts within Europe, both West and East. Huh.. ITUG again, 404 no surprise I guess. RTUG, 404 on the Connect website. Well what did I expect. must be sanctions. Try Google again, nothing. So they got to Google too. This is disappointing, but I can’t speak Russian anyway. So, I digress, back to the list, VNUG, The Viking NonStop User Group from the Nordic region, again a Connect 404, this Tandem word article must be old and it is. I will need to rely on Google after all. http://www.vnug.biz/news.htm is there but has not been updated since 2017, the site is still advertising our eBITUG 2017 event. Thanks guys. More searching reveals a page on the Connect site advertising the VNUG 2018 event in September, I wonder if I could find an excuse to go. The VNUG events have always had a good reputation and this could be a good opportunity to promote eBITUG 2019 while enjoying Stockholm. More searching reveals that unfortunately this years VNUG event had to be cancelled due to lack of support. What a shame and what is happening here.? 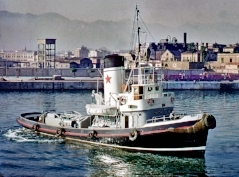 Ok onwards through the old names, ITALIATUG Italian NonStop Users Group, Connect 404… and this Italian Tug Boat picture. Next GTUG, well I know our friends at GTUG are still going strong so no problems, this years European Symposium was hosted by GTUG in Leipzig, Germany. FTUG, the French Tandem User Group, I know this has long since dissolved. Next BITUG, this list is clearly not in alphabetical order, but we are still here and going strong. This was a sobering exercise, it looks like currently only GTUG and BITUG remain in Europe from a list of what was once 7 strong, we sincerely hope VNUG recovers and is once again able to support a user event. All and any NonStop Vikings, Russians, NonStop users, or vendors from all over Europe and indeed worldwide are welcome to eBITUG Edinburgh. At out last eBITUG in 2017 we even had visitors from New Zealand. But as the above shows user groups are like pubs, muscles and brain cells, use them or one day find them gone. I appreciate that for all of us travel expenses and days out of the office are a challenge especially when it comes to attending conference events like BITUG and we understand this, Personally, I was unable to secure the expense of GTUG attendance this year. This was a real shame as GTUG always put on a fantastic show and feedback from this year’s event showed 2018 was a strong event as expected. I consider these events “education” and required to keep my skills and contacts relevant. NonStop is moving fast folks. For many European NonStop users Boot Camp in San Francisco is only a dream, this is where the regional user groups fit in. The European NonStop event, either hosted by BITUG or GTUG will be the only place left in Europe where NonStop users will be able to see and meet senior HPE product people and engineers who will present the HPE NonStop Road map and Performance updates in person. Real opportunity for question and answers exist in these smaller regional settings. Of course, on years where we are not holding the European NonStop Symposium we will still hold Big and Little SIG events where we are supported by the great people at HPE UK and Europe. This events still represent a fantastic opportunity for dialogue direct with HPE. Following the upcoming Little SIG we will be hosting a free half day education session focused on Virtual NonStop at the HPE offices London and remember that attendance is free for Little SIG, Education Day and Big SIG events. However, because of the scale and costs involved in the eBITUG event we do need to charge a small fee for attendance, but not in the same league as other international events, this will be £150 per attendee at the early bird rate and £250 thereafter. There is one way to secure free attendance (and maybe more) for the upcoming European NonStop Symposium in Edinburgh, come and share a story with the NonStop community, tell us something, user stories are what truly unites the user community, what went right, what went wrong, how you averted disaster or performed a zero-downtime migration. If you have a story you think would be of interest to other NonStop users and perhaps HPE then let us know. We are a friendly bunch and who couldn’t do with working on their presentation skills. So, if you can present a story you will get free attendance at eBITUG. Support your user groups by attending our events, the more end users we have attending the more vendors want to come, the more end users want to come. this is a cyclical thing. Vendors supporting community supporting the vendors. It is just like that pub we all used to like in the village that closed. when did we last go there and support it? The next BITUG event in London will be our Little SIG on December the 4th kindly hosted by Lloyds Bank in London. Little SIG will feature, a short “Crypto Currency Update” by me (Damian) and additionally either a “Java for production OLTP” or perhaps “Build API web services in NodeJS in under an hour” presentation / demonstration again by me, session, let me know if you have a preference. The Little SIG event will also feature a “UK Terrorism Update”” update session and a session featuring IBM MQ 8. In addition to the above we will of course feature the HPE NonStop roadmap and post Bootcamp update sessions. This will a packed day and I hope to see many of you there in December. On Wednesday December 5th we will host an vNonStop Education half day at the HPE Offices London.